My home is held together by hot glue.... well not really but this has got to be one of my favorite tools. I have a range of tools I can use to join things from Mig welders to biscuit joiners but nothing beats hot glue, especially when you can wander your home in search of “glue jobs” without the need to be plugged in. My wife says Im “Packing heat” when I go on one of these “stick em up” rampages! On the workbench today we have a generic gluegun purchased from Dicksmith electronics, price $69 AUD. That price is dearer than most, if not all the electric variants of this tool but having owned a couple of plug in models before this one I can say I would never go back. The only drawback from having gas as the heat source/fuel is having to refill. The advertised duration of a single fill is supposed to be 20 minutes but I am yet to get more than 12-14 minutes of hot glue from a fill. I can live with that though as there are many, many fills in a 200g butane gas bottle, perhaps as many as 18. These refills are around $8-10 AUD. This image shows where the heat element and exhaust are located, directly below the triangle symbol (the international symbol for “as hot as the sun”) you can see into the element, in a dark room you can see this spot glowing. Under normal usage however, the entire glue gun remains cool enough to touch, apart from the brass tip you can see in the photo. This tip does have a rubbery cover which we presume is a safety feature, it is also quite durable. The benefits of a cordless gas gluegun are many, portability obviously but also it does a better job than an electric gun. 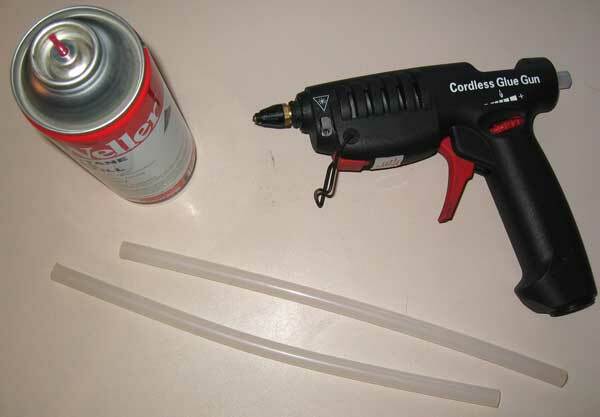 The reason being this glue gun gets hotter, so the glue reaches a higher temperature. This means the glue will flow better and give you a little longer from when you apply the glue to when you must have the parts to be joined, attached to one another, as it takes longer for the glue to cool. 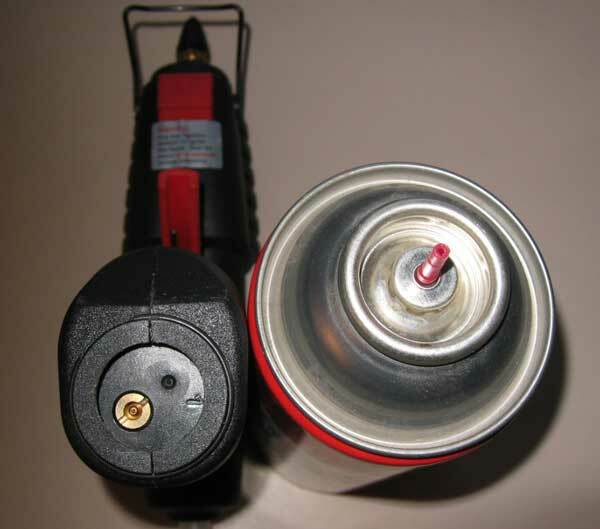 Gas glue guns also heat up faster so you are locked and loaded, ready to blast within 1 minute. 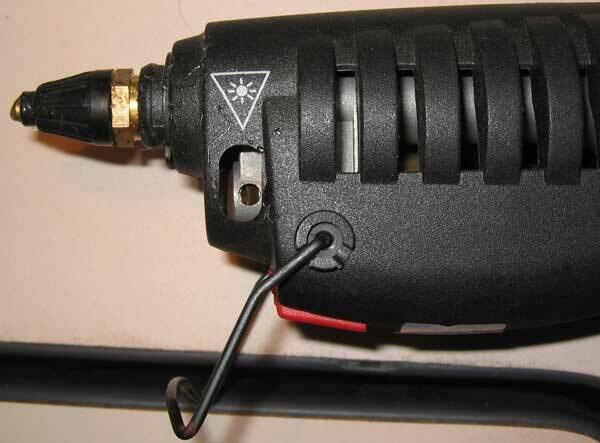 The uses for a glue gun are many. I have several items in my computer case installed via hot glue. I have UV lights, fan switches, cabling, and temp sensors all attached via hot glue. Further afield I have used my glue gun in the following ways- installing the door mounted tweeters in my car, attached the base/mount for 8” LCD screen in my car, routing home theater wires neatly around rooms I even attached an old fan to my Ti4200 video card in my HTPC after the original one failed, the replace meant was too large to screw on.